Becoming a survey participant with Mercaris can help your business grow - and as a participant you have access to a suite of solutions at no charge. Trade reporting is easy and takes about 10 seconds per contract. Participants can also upload or email their own reports directly (excel, word, etc.). Participating in our survey is perfect for any first handler of grains, edible beans and oilseeds. And don't worry: participation is confidential. Mercaris anonymizes the data, so we never reveal your identity or your location. Why become a Survey Participant? Mercaris data can help you! Understand the competitive landscape: Compare yourself to the marketplace → understand your prices and how competitive you are compared to everyone else. Track Market Trends Important to your Business: Understand macro-economic forces that can impact your business. For example, foreign supply (imports) & currency strength. Enlightened Self Interest: better information is good for the sector as a whole -- for organic markets to continue to grow sustainably, market information is necessary in making business decisions, running more successful operations, acreage expansion, etc. Survey participants gain access to our industry-first online market for organic, non-GMO and identity-preserved commodities. 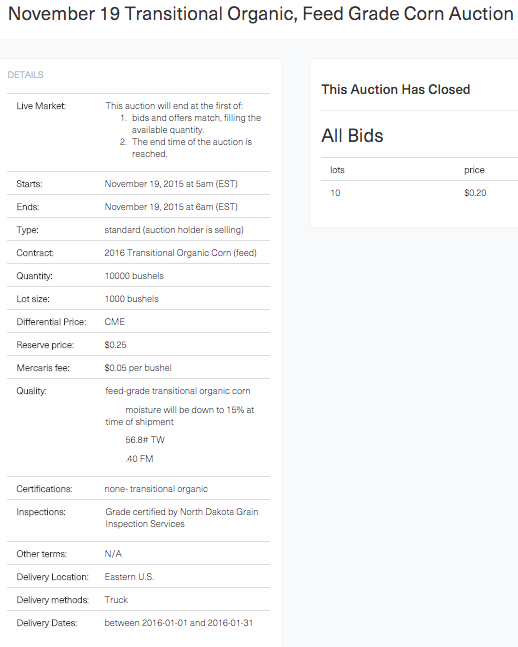 In addition to being able buy and sell commodities, you also get access to our historical auction data, where you can view previously held auction details by quantity, lot size, contract type, quality specifications, certifying inspection service, & delivered region, as well as bid price. View Mercaris delivered prices through custom specified time periods for Organic Corn, Soybeans, Wheat and Dry Edible Beans, as well as non-GMO Corn and non-GMO Soybeans by region, crop year, spot contract, forward contract, end usage, and by total volume reported by the Mercaris Market Survey™. Plus various other newsletters and reports. How is Mercaris different from the USDA Organic Prices? View previously held auction details by quantity, lot size, contract type, quality specifications, certifying inspection service, & delivered region, as well as bid price. 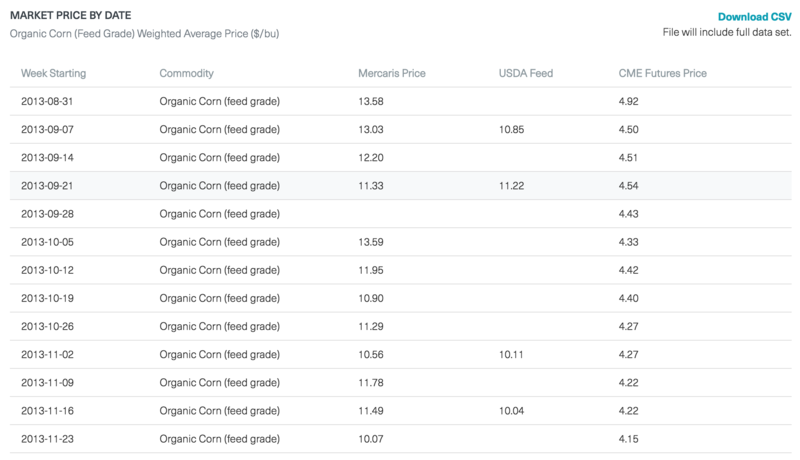 Follow weekly movement of delivered transaction prices for Organic Corn, Soybeans, and Wheat with the Mercaris Organic vs. Conventional Report. Compare our data side-by-side with USDA farm gate prices and conventional CME futures market prices. Organic farm gate prices come from the US Department of Agriculture’s Agricultural Marketing Service (AMS) biweekly report. This report displays the transaction-weighted-average prices of organic grain alongside the conventional nearby futures contract price. The full data set is exportable to Excel. View Mercaris delivered prices through custom specified time periods for Organic Corn, Soybeans, and Wheat, as well as non-GMO Corn and non-GMO Soybeans by region, crop year, spot contract, forward contract, end usage, and by total volume reported by the Mercaris Market Survey™. 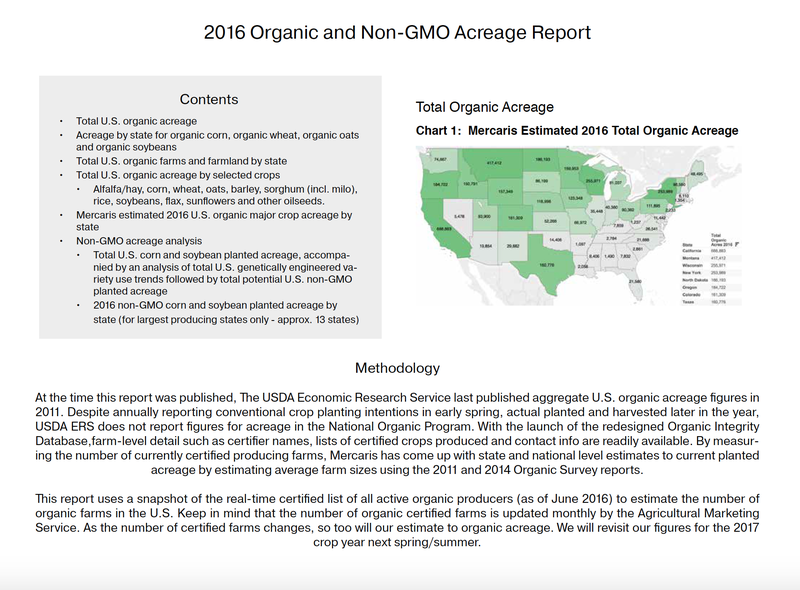 * The Mercaris Market Survey™ is the most comprehensive and largest Organic and non-GMO data set available to date. More than 50 first handler facilities participate, encompassing 8-12% of the total domestic Organic and non-GMO market. Survey participation is constantly growing and evolving to further our market reach. 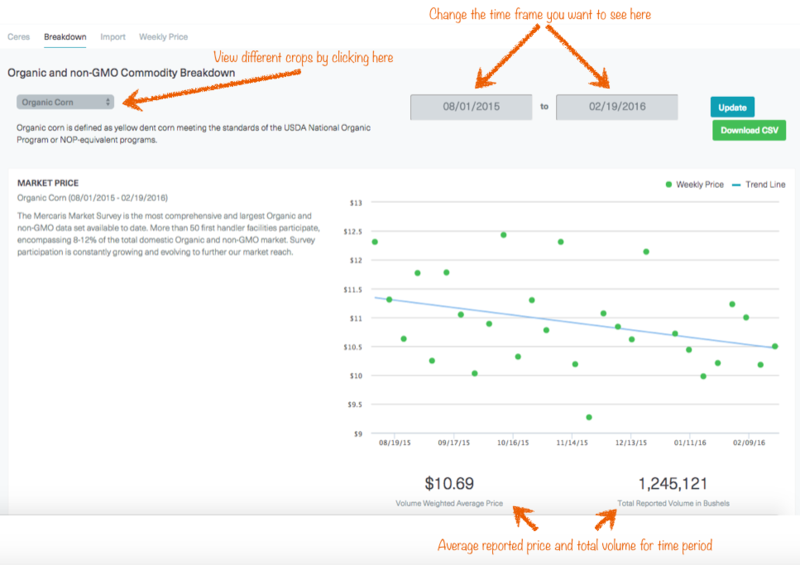 † Limited Price Breakdown Report users will only have access to the past 12 months of data. Monthly US import activity for organic corn, soybeans, and durum wheat that compares seasonal volume totals to prior years and estimates full year projections. The report also summarizes prices and import volumes by FOB origin country and delivered to the US port by month and on average for each origin country. 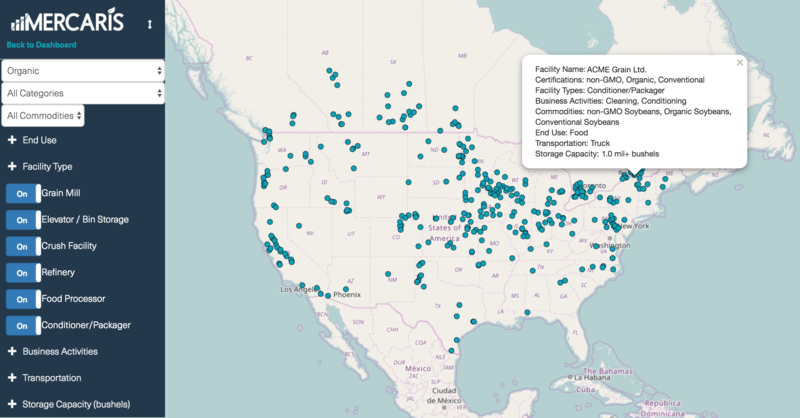 View and search all organizations that import organic corn, organic soybeans and soybean meal into US Ports. See volumes by port of entry, country of origin and foreign port of lading. Manipulate this information for your own analysis - please contact us if you would like a csv data file. As always, you can easily view graphs with annual import volumes, import volume by country, monthly average import prices (FOB and delivered US price), annual averageimport prices, and YTD average import prices for organic soy, organic durum wheat, and organic corn on the Mercaris dashboard under “imports report”. The Quarterly Maritime Report is not meant to substitute for this report, but rather to provide additional information to the the imports report on your Mercaris dashboard. Our Monthly Market Update Report is sent to your inbox to help you assess current market conditions, and make the most strategic decisions. 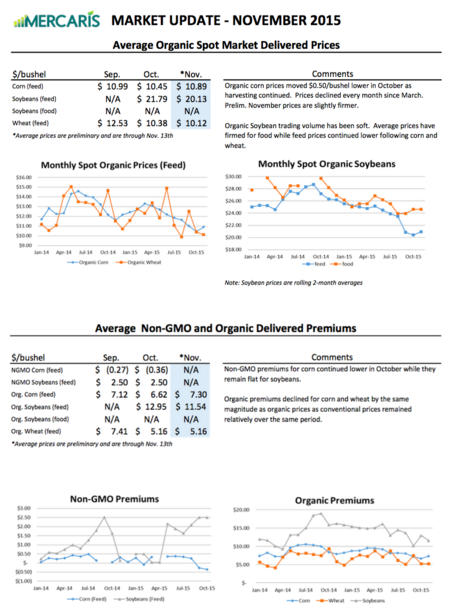 The report summarizes average organic and non-GMO delivered spot prices, premiums, & imports, as well as current macro influences affecting market conditions.